To Blog or Not To Blog: I'm So Lame. I'm having problems finding inspiration for Crossed Times. Argh. And to top it off, I'm trying to find some part time work and it's just annoying the hell out of me. Which means things are moving a bit slow on creativity front. Eventually it'll be out though, but in the mean time I'll try and fix my lack of imagination. I think I left it somewhere (along with my brain). Also I'm finding it hard to fit in sim life with real life. How sad. Haha. I'm so not organised in the slightest. Double argh. So we'll see how things flow. In the mean time I'll leave you with an awesome picture. 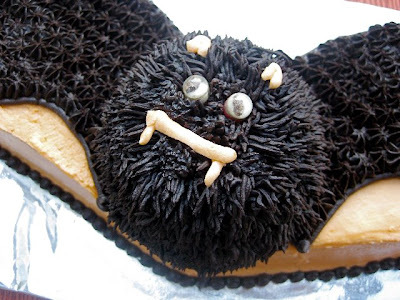 A cake with fangz! Omgz! Edit: Okay as Randy has pointed out, the cake is in actual fact a biscuit. Shhhh. LOL. That'd involve a lot of editing and censoring. Who knows what you're hiding! and Fury, what about the creepy lady that was lurking in the background, eh? EH?